Billboard: Iggy Azalea is putting behind her a year she would â€œmemory-eraseâ€ by releasing a new tune, “Team,” the lead single of her sophomore set “Digital Distortion”. “Team” is the Aussie rapperâ€™s first new music since “Pretty Girls,” her collab with Britney Spears which dropped in May 2015. The electro hip-hop track dropped this morning on iTunes and will earn its first public performance when Azalea appears next week on The Tonight Show Starring Jimmy Fallon. “Keep on pushing, like a dealer/ Keep on shooting, Reggie Miller/Go and give ’em all the finger/You gotta set the score right, call it Hans Zimmer,” she raps in “Team”. Watch the lyric video below. Iggy Azalea has released on Twitter this Tuesday (March 8th) the official cover and the release date for the lead single of her next album, “Digital Distortion”. “TEAM” will be released on March 18th. 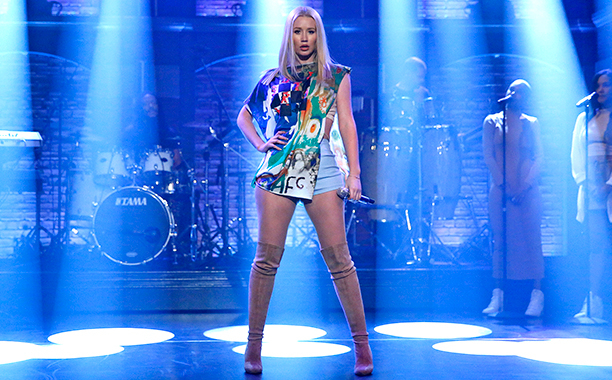 Iggy Azalea has revealed the album cover for her sophomore effort “Digital Distortion”. The singer shared the cover via a Twitter video, which was appropriate for showing off its lenticular cover. â€œSneaky little #DigitalDistortion preview for you guys,â€ the Aussie rapper tweeted. Anyhow i could say ALOT – but ill keep it mildly professional. Just wanted to let some of you guys asking know whats happening. Vulture: Even if Iggy Azalea never saw the instant-classic meme of Sarah Palin’s bizarre Donald Trump speech dubbed over her own equally bizarre live rapping, she would’ve been having a bad week. Not in the very least because, as she shared with fans in one of her usual TMI-filled stories, she peed herself during a root canal on Wednesday. (In her defense, Iggy says she was sedated for eight hours.) No, her real hump-day woes stem from an already-backfiring career comeback: The rap pariah tweeted last night that her label is refusing to let her film a video for her “buzz” single “Azillion” because her hive has not been buzzing loud enough. She released the song under the presumptive impression that it would go “viral” â€” in fact, she notes in her tweets, it already has. “I felt like it was dope so, whatever. Ted Cockle doesn’t wanna see me shine. What can I say,” she ranted, calling out the president of Virgin EMI, as you do when you’re keeping things “mildly professional.” Of course, only the internet can decide what goes viral, and it appears the internet has spoken: 879,000 streams does not a viral hit make. So, what’s a disgruntled artist to do? “If all else fails, I’ll just drive around L.A. and play my new album really loudly every Monday from 4-6pm hahaha.” L.A., you’ve been warned. Idolator: Iggy Azalea promised to deliver new music yesterday (January 14) and she came through in the early hours of the morning with a snippet of â€œMiddle Man.â€ The second buzz track from sophomore LP Digital Distortion finds the Australian rapper in a combative mood. The 25-year-old touches on the mayhem of the last 12 months (sheâ€™s still the realest) over a spooky beat courtesy of production collective D.R.U.G.S. (Dirty Rotten Underground Sound).